Skunks are adaptable insectivores that do quite well in urban environments, where lawns and other landscaping make fine feeding grounds. Photo by Sebastian Kennerknecht, pumapix.com. And for most Bay Area residents, that’s where it ends. Road-killed skunks are generally nothing more than minor if unpleasant distractions, gory little reminders that nature occasionally intrudes on our well-ordered suburban lives. But these highway casualties point to something larger. They are reminders of a great flux taking place at the edges of our awareness, one shaping our parklands, open spaces–even our backyards. Striped skunks are mesopredators: carnivores of intermediate size. So are raccoons, opossums, gray and red foxes, feral cats, and coyotes–all Bay Area inhabitants. When considered singly, the impact of mesopredators may seem minimal. They don’t have the cachet of cougars or black bears. TV cameras don’t show up when a raccoon or opossum raids a garbage can. But what they lack in size, they make up in sheer abundance. They shape basic ecological processes by what they eat and by where and how they live. They demand our attention–even our respect and admiration–for their resilience and toughness. This, after all, is their time: In an increasingly urbanized world, the mesopredator reigns supreme. TV cameras don’t show up when a raccoon or opossum raids a garbage can. But what they lack in size, they make up in sheer abundance. In a 2009 article published in the journal BioScience entitled “The Rise of the Mesopredator,” the authors describe a phenomenon known as “mesopredator release”–the rapid population growth of intermediate-size mammalian carnivores in the absence of larger top predators. The Bay Area is an epicenter of mesopredator release. Mesopredators are happy to live with–and off–us. Our homes are often, quite literally, their homes. They thrive on our garbage, on the pet food we leave on our back porches, on the mice and rats our refuse attracts. For many mesopredator species, we are indulgent benefactors. For others, we are easily circumvented obstacles. Raccoons are omnivores that have adapted to eat pet food and other leavings of humanity, though this one in Mount Diablo State Park could be getting by the old-fashioned way. Photo (c)2009 Yamin Bilal, chochenyonature.com. Of all the region’s mesopredator species, none is thriving more extravagantly than the raccoon. This is pretty evident to anyone who has driven Bay Area roads, lived in a Bay Area suburb, or even left a bowl of dog food on the back porch. Reginald Barrett, professor of wildlife management at UC Berkeley, says the research on Bay Area raccoons is scant: Most of the work has been done in the Midwest, focusing on the species’ impacts on waterfowl. A raccoon takes advantage of another park visitor’s leftover baguette, undeterred by the cover on this trash can. Photo (c)2010 Yamin Bilal, chochenyonature.com. And many Bay Area residents are active–or at least complicit–in raccoon care and feeding. Most people suffer a few raccoons feeding opportunistically on pet food left on the back porch. But other folks purposefully spread a groaning board for raccoons; they are besotted with the little masked predators. For opossums like this one, there is no old-fashioned way in the Bay Area—they were introduced here in about 1910. Photo by Sebastian Kennerknecht, pumapix.com. Raccoons have a couple of peers in the Mesopredator Success Sweepstakes: opossums and the aforementioned striped skunks. The only North American marsupial, Virginia opossums–as their name suggests–are not native to California. Introduced to the state in the early 20th century, they have since spread to all but alpine and desert habitats. They are prolific breeders and feed on everything from carrion to small mammals, insects, and fresh fruit. They also dote on garbage and pet food and find crawl spaces, outbuildings, and old cars congenial habitations. Not surprisingly, they are abundant in the Bay Area. Like raccoons and opossums, skunks are relatively fecund breeders, with sexually mature females producing one litter a year of one to five kits. They are solitary animals by nature–which is just fine with everything else that shares their habitat. Virtually all mammals give them a wide berth. Barrett has been involved in a remote camera project around water sources on San Benito County ranchlands for several years, and he notes it has been particularly instructive when it comes to striped skunks and their interactions with other animals. Even those mesopredators that require environments somewhat more expansive than a suburban backyard are thriving in the Bay Area, thanks to the region’s abundant open spaces–national, regional, county, and state parks and protected watersheds. Among these are two species that were de facto apex predators here 20 years ago: bobcats and coyotes. They have been “demoted” to mesopredator status in the past couple of decades only because of the reappearance of mountain lions. 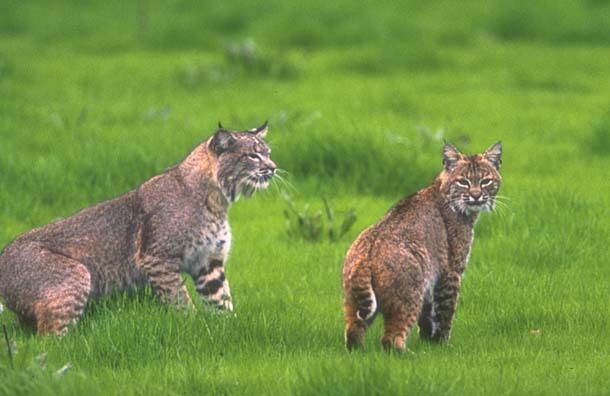 This pair of bobcats (male on left, female on right) was seen at Sunol Regional Wilderness, not far from the parking area. Photo by Joseph E. DiDonato, Wildlife Consulting and Photography. If bobcats are reasonably numerous, coyotes are positively ubiquitous. They’re common in most of the large parks and open spaces of the East Bay, North Bay, and Peninsula and are seen with increasing frequency in the Bay Area’s smaller parks, particularly those with riparian zones. They are often spotted foraging for voles, pocket gophers, mice, and ground squirrels on grassy hillsides, in croplands, even along highway medians. Gray foxes, unlike nonnative red foxes, prefer uplands, and are even known to climb trees. Photo by Bruce Finocchio, dreamcatcherimages.net. Indeed, cats–feral cats–also make up a significant portion of the Bay Area’s mesopredator biomass. This is worrisome for biologists, given that Felis catus is an introduced nonnative species and public enemy number one for songbirds, particularly ground-nesting varieties. “Cats have a significant impact [on native wildlife]” says DiDonato, citing a University of Wisconsin study that concluded feral and domestic cats kill at least eight million wild birds in the state annually. The issue is further complicated by the emotional bond many people share with cats, domestic or feral. House cats are often dumped at parks by owners unable or unwilling to care for them, and some feline advocates feed feral cats despite specific proscriptions against the practice in many jurisdictions. Attempts to eliminate feral cats on public lands are often met with fierce resistance by animal rights activists. Gray foxes are among many mesopredators, from common raccoons to elusive badgers, that live in nearby wildlands and even in our backyards. This fox drinks from a pond where photographer Bruce Finocchio had set up a photo blind. Read about how he captured this remarkably intimate image. Photo by Bruce Finocchio, dreamcatcherimages.net. Grays and reds vary markedly in genetics, appearance, and behavior. The gray fox is smaller and prefers to forage in uplands. It is the only North American canid that can climb trees, often in search of fruit and nuts. The red fox is more aggressive and more generalized in its habitat requirements. Unlike gray foxes, it will happily hunt in marshes. This has made the species deeply problematic for wildlife managers; red foxes have been linked to the decline of the listed California clapper rail and salt-marsh harvest mouse. And though red fox numbers may have begun declining in recent years, they remain a concern. A rich array of other mesopredators are found in the nine Bay Area counties, especially mustelids (weasels and their cousins). Though rarely seen, long-tailed weasels–perhaps ounce for ounce the most voracious of the state’s predators–are very common, particularly near wetlands. Out in marshlands around West Pittsburg, freelance biologist Jim Hale captured six weasels on a single set of live traps meant for salt-marsh harvest mice. A long-tailed weasel in a culvert near a residential area in Danville. Weasels are ferocious predators—one biologist who tried to handle them described them as “greased lightning.” Though not commonly seen, they are relatively plentiful near wetlands. Photo by David Jesus, davidjesus-naturephotography.com. The weasel’s bigger aquatic cousins, river otters, also appear to be thriving. These sleek and playful mammals are formidable predators with catholic appetites. They’ll gorge on fish of all species, shellfish, reptiles, amphibians, and small mammals. A related mesopredator, however, is struggling. The American badger inhabits grasslands throughout the state, including the open range of eastern Alameda and Contra Costa counties. Unlike long-tailed weasels, minks, and red foxes, badgers are not suited to marsh habitats and thus are not benefiting from the extensive wetland restoration projects now under way in the Bay Area. Nor are they generalists like striped skunks, opossums, and raccoons, able to profit from our garbage and infrastructure. Their needs are specific: large expanses of grassland that contain an abundance of burrowing rodents, particularly ground squirrels. Though such rangelands do exist in the eastern and southern Bay Area counties, they have been shrinking steadily for more than 50 years and remain under long-term development threat. Relatively slow-moving and slow to reproduce, badgers are especially vulnerable around motor vehicles. In a 2008 study on Bay Area badgers, San Jose State University graduate student Chris Lay noted that badgers disperse less readily across wildlands than most other predators due to their difficulty in negotiating barriers–for example, highways. When they encounter roads, they tend to get run over and killed. Low-slung and hard to see, nocturnally active badgers seem especially susceptible to becoming roadkill. Photo by Bruce Finocchio, dreamcatcherimages.net. “Badgers are nocturnal,” says DiDonato. “They’re moving around when visibility is poor. Plus, they’re low to the ground and hard to see.” Certain roads, Vasco Road for example, cross some of the best remaining badger habitat in the Bay Area. Considered from a larger perspective, then, badger mortality on Vasco Road may be an issue for regional badger populations. Despite these sobering statistics, one heartening fact remains: There are tens of thousands of acres of protected land in the East Bay, including some prime badger habitat and plenty of space where skunks and raccoons thrive far from the nearest dish of dog kibble. Overall, the Bay Area’s mesopredator complex remains as Bell described it: healthy. And disease, habitat loss, and highway encounters are unlikely to change that. Nature is vulnerable in many ways, but in other respects it is implacable, a force ready and able to fill any cracks that appear in our fragile civilization. Those sounds of crayfish being crunched in a neighborhood creek, of garbage cans assaulted and tipped over in the wee hours? Get used to them. They’re only going to grow louder.